The White House in Washington D.C. always creates such a magical holiday at Christmas time. A few years back a spectacular Gingerbread house was created with white chocolate columns, sugar windows, and a foundation made from chocolate glue. 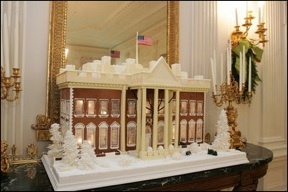 The White House Gingerbread house, created by White House pastry chef Thaddeus DuBois, was on display in the State Dining Room. I am very excited to learn about the 2008 White House Christmas and what the decorations will entail. Visit back at Gingerbreadfun.com as I will surely be posting up pictures and details as soon as the announcement is made.